The Beverley Historical Society was formed by volunteers in 1987 to foster the safe keeping and promotion of Beverley`s Heritage. The society operates from the Dead Finish Museum in Hunt Road Beverley. As the oldest building in Beverley, the “Wheatsheaf Inn” was built by Alfred Smith in 1872. Our current major display is the “REMEMBERING THEM EXHIBITION” – a wonderful centenary tribute to all those Beverley people who served or helped with the World War I effort. 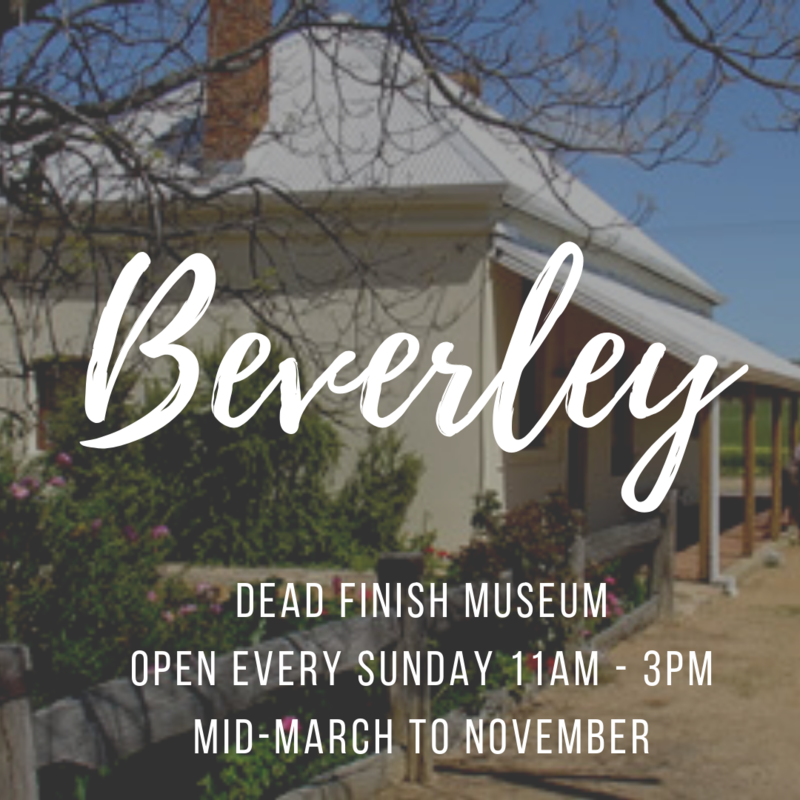 MEETINGS: held at the Dead Finish Museum at 1.30pm on the 2nd Monday of each month between March and December. New members are always most welcome. mid-March to November and at any other time requested. ADMISSION: $2 adult and children with adult free. To open up please Call Joy 0427 411 881, Maree 9646 1149 or Delys 9646 1075 . The Beverley Historical Society has preserved the lifestyle of yesteryear within the museum. The many rooms are filled with memorabilia, tools and equipment used in the days of early settlers. ﻿Almost one hundred years after some of Beverley’s young men faced the horror of the battles at Gallipoli, descendants & other family members welcomed the opportunity to inspect the Beverley Historical Society’s exhibition ‘Remembering THEM’. Volunteers from the Beverley Tree and Garden Society assist our group by maintaining the beautiful gardens that surround the Dead Finish Museum.